Spanish GP: Can 'Karate Kid' Lewis Hamilton chop down Nico Rosberg? A quick hop to the Catalonia coast. A short drive north to the Valles region above Barcelona. The Pyrenees on the horizon. Going to the Spanish Grand Prix feels a little like coming home for the Formula 1 fraternity. The place is familiar from thousands of miles of pre-season testing. And 25 years of races, dating back to its famous debut in 1991, when Ayrton Senna and Nigel Mansell duelled wheel-to-wheel, centimetres apart, sparks flying, down the long pit straight. 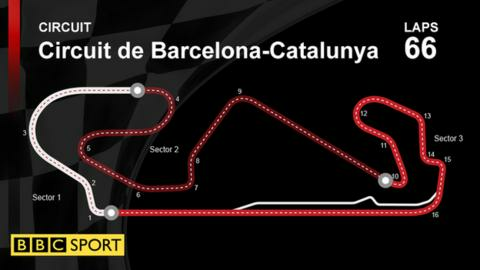 That first race on the Circuit de Catalunya was in some ways a misleading debut. Held in early autumn, rather than the since-traditional spring date, it rained, and there was action aplenty. In its new date, the race is nearly always dry - remarkably, the last wet one was Michael Schumacher's brilliant first Ferrari victory in 1996 - and the racing is rarely scintillating. The track is a marvellous test for a grand prix car - all long, challenging corners, which put a premium on aerodynamic excellence, and give the tyres a tough time - but that makes overtaking difficult. Bold and beautiful Barcelona down the road. The place packed with fans worshipping their hero Fernando Alonso. Filigree seed pods drifting on the breeze. Some great fast corners - Turn Three, Turn Nine - to watch F1 cars and drivers at their best. It is a weekend to savour. BBC chief F1 writer Andrew Benson.